As I've mentioned a few times before, I often found myself following in my brother's footsteps. While some people would take great pride in the fact that a younger sibling wanted to be like them, my actions mostly just annoyed my brother. My collection of Blackstar toys is yet another example of a time when I thought something my brother had was cool and I wanted something similar. The Blackstar toys I had were from the 1983 Series 1 Galoob production. If my memory serves me correctly, a majority of these were purchased at the same time at a discount store in a nearby town. Thanks to Blackstar, I had something that was mine to compare to my brother's impressive Masters of the Universe collection. The funny thing was, I don't recall ever watching the Blackstar cartoon before I got these figures. The only reason I even wanted them in the first place was because they looked like He-Man figures. So my collection grew to include several figures and accessories -- each came with either a Trobbit or a demon depending on if the figure was a "good guy" or a "bad guy." I recall the Warlock Dragon as a pretty cool toy but the Hobbit Wind Machine being not much more than a glorified beach ball. My Blackstar collection is gone today. After many years stored in my parents' shed, I believe the figures were lost in a tornado that took a barrel full of toys off to where tornadoes go to die. The Ice Castle met an earlier fate when it fell to the floor of the shed and shattered into hundreds of pieces. Apparently cheap plastic cannot withstand a sudden impact after being stored in various temperatures for long periods of time. 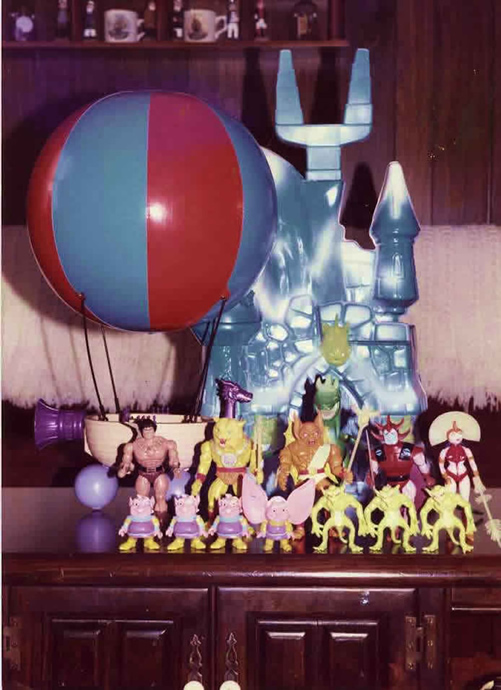 So today my "collection" of Blackstar figures is found only in the snapshot below from the the mid-80's.